Winter jasmine plants are deciduous perennials. They are considered vines or viny shrubs and belong to the olive family. Unlike most jasmines, this type is not fragrant, but, perhaps as a tradeoff, the plant's stems stay green in winter. Winter jasmine plants are native to China and grown in USDA plant hardiness zones 6 through 10. 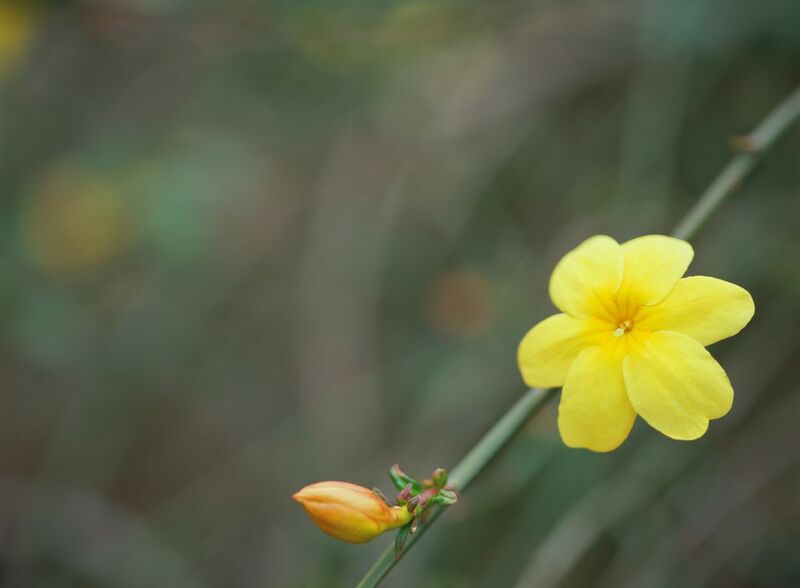 Plant taxonomy classifies winter jasmine plants as Jasminum nudiflorum. For research purposes, note that Jasminum polyanthum also sometimes bears the common name, "winter jasmine." But that is a different plant (and a fragrant one that many gardeners want to grow). This is just one example of why we use scientific plant names to avoid confusion. Winter jasmine plants reach 4 feet in height with a width of 7 feet when unsupported. Supported, they can reach 15 feet in height. Its plentiful yellow blooms are about 1 inch wide. Blooming time is in late winter or early spring. The flowers appear prior to the leaves, which are quite tiny. You can grow this plant in full sun to partial sun, in well-drained soil. In fact, it is one of the best perennial vines for sun. A winter jasmine plant mounds up around its base to form a shrub, but it sends out long branches from that central clump that grow as creeping vines. So is it a shrub or a vine? To a large degree, you can determine what it becomes. That is, how you care for the plant determines what form it will take. If you keep it pruned back, it will act as a shrub in your landscape. But if you leave it alone and allow it to grow naturally, it will function as a vine. In the latter capacity, it can be used either as a ground cover or as a climbing vine. Gardeners who want it to climb should provide a supporting structure, such as a wooden arbor, tying the viny branches to the structure. Alternatively, these early bloomers can be useful as ground covers. In the latter role, use them for landscaping on slopes, for instance, to control erosion. If you are going to prune these plants just once over the course of the year, the ideal time to do so is in spring, right after they have bloomed. They flower on old wood, so by pruning at this time, you will not lose any flowers for next year. If you want to control their spreading, you may want to prune multiple times, even though it means fewer flowers for next spring. The plants do not need to be fertilized very much, but if you want them to get especially big for any reason, work some compost into the ground around them. Unsupported winter jasmine plants grow as viny shrubs and can be somewhat invasive. This is because the stems put out roots wherever they touch the soil. Faithful pruning is required to keep unsupported plants from spreading where they are not welcome. Spreading is much less of a problem if you train the plants to grow up a support, like vines. By tying their stems to arbors or trellises, you avoid ground contact, for the most part, minimizing the opportunities the plant has for taking root. On the other hand, this aggressive rooting makes it easy for gardeners who actually want the plants to spread and multiply. After the rooting occurs, simply sever the rooted stem from the main plant, and dig your new baby out by the roots. Then, either pot it up or plant it somewhere else more suitable in your landscaping. With its ability to multiply, you can see how this plant could be a good idea for a planting bed, where what you need is something that gives you flowers, spreads to fill in an area quickly and needs little care.